This is not a review. Samuel French Inc., the licensing agent representing the Harold Pinter estate in the U.S., has decreed that the Wooster Group’s production at REDCAT of Pinter’s first play, “The Room,” shall not be reviewed. 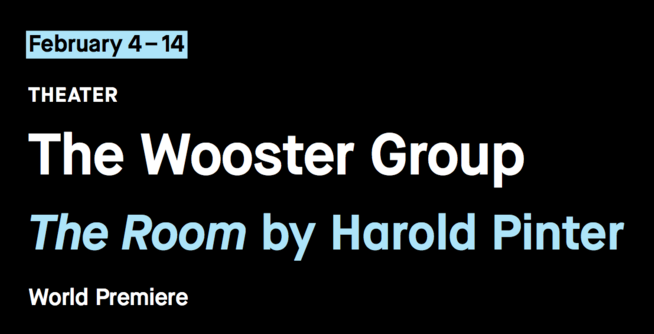 After all of the hoopla, in and about the Los Angeles press, that took place prior to the opening night of Wooster Group‘s world premiere of Harold Pinter’s play, The Room, a conclusion one could come to is that what was witnessed was simply, art. And regardless of the circumstances surrounding rights and permissions, who should be allowed to view this play, illuminate it or write about it – or how, this perhaps once-in-a-lifetime production, which may never be seen again by the Los Angeles public, should indeed be on every serious theatre goer’s list. I’m incredibly thankful, it made mine. To be able to track the evolution of a great artist from his or her first step is more than just an intrigue. It is magnificent. Even in this case, where Wooster Group’s rendition in all of its heightened trademark avant-garde glory, is not without flaws. But then, what are we here for? Writers to write. Theaters to house plays. Production companies to produce. Actors to play. Audiences to witness, experience and talk about all that has been seen and heard and felt so that real art can live indefinitely for lifetimes past the original showcase, creating pieces of breathing history and legacy. There are devices that Wooster Group uses in this production that are so weirdly and remotely unique which at first one might attribute to the existentialism of the times. Highly sophisticated and perhaps purposefully independent of Pinter’s thought, the experience is experimentally interesting enough to continue discussions of it past this brief moment. There is no better reason than this to make the trek downtown for this limited run. The cast includes Wooster Group members and associates Kate Valk, Suzzy Roche, Ari Fliakos, Philip Moore and Scott Renderer. Lighting: Jennifer Tipton with Ryan Seelig; original music tracks: Omar Zubair; sound: Max Bernstein and Eric Sluyter; sound consultant: Bobby McElver; video and projections: Robert Wuss and Max Bernstein; assistant director and costume supervisor: Enver Chakartash; stage manager: Erin Mullin; production manager: Bona Lee; and technical fellow/sound assistant: Gareth Hobbs.